Personalize your church-specific art images and photos with the FREE Online Caption Editor. Now it's easier than ever to quickly and easily add your own caption to any of our professionally designed church-specific art and images — even photos! Choose from thousands of editable church-related art, clipart, images and photos. Add and save your own caption or save the image without any caption at all. Choose from a variety of font options to create your perfect caption for your church graphic. From whimsical script fonts to bold, traditional fonts – you can design the perfect caption. Rotate your font for the perfect fit. Changing the existing font color on our church art images or photos is a snap. Simply highlight the text you wish to change and choose the color you want. Can't find the color you want? Select "More colors" to choose from virtually every color. Like a church clipart image but prefer not to have any caption at all? You can easily remove the caption from any art with the caption editor tool. Photos and PowerPoints are automatically provided without captions. The online Caption Editor also lets you crop an image to any size you wish. You can add additional white space to clipart or crop a photo. Simply drag the border to crop. When downloading an image, you'll always have more than one file format to choose from. Art images are provided in print and web ready formats. Enjoy a 14-day FREE TRIAL to explore every feature of ChurchArt Online. Your Free Trial cancels automatically unless you choose to continue your membership. Adjust your font size, type and color in a few simple clicks — to get the church-specific art or image that best fits your needs — the options are endless! 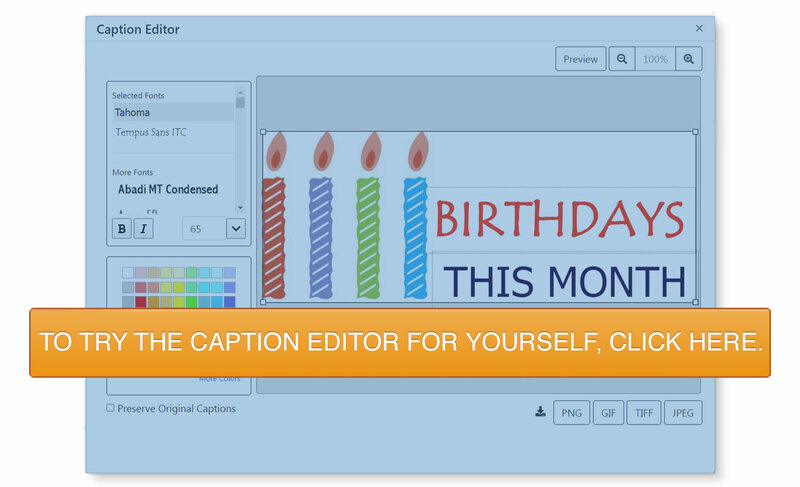 We invite you to explore the caption editor demo to learn more about the many features offered! I just wanted to let you know how very pleased I am with our Church Art Pro subscription! The images and versatility (with the edit caption options) is such a HUGE value. THANK YOU for your attention to the needs of the church and the ever-changing media in which we work to stay current in peoples' lives. "The one thing that I love about ChurchArt is the ability to edit. As a Spanish speaking church this is very helpful." "I absolutely love this program!!!! The caption editing is truly amazing." "Just wanted to thank you. I've subscribed to your site for many years. I was thrilled when you added the "Edit caption" feature. Today, I feel especially thankful for that feature… I deleted all the text and the picture was exactly what I wanted, and I didn't have to mess around with it for hours trying to cover the text so I could use it. That feature saved me so much time today, that I just had to stop and thank you for that wonderful feature." WOW!!! I am so excited about the changes you have made regarding the font. It really makes a great difference to be able to change the font size and also to have all those new fonts to choose from. We love it!! Keep up the awesome work!! Editable captions! What a GREAT idea! You've just eliminated much of the tedium of web maintenance and bulletin preparation. Sign up for your 14-Day FREE Trial! Enjoy every feature for 14 days FREE! We believe you'll be so delighted with ChurchArt.com that you'll want to become a member. After your free trial, you may choose to continue with our Basic membership for only $5.99 a month or the Pro membership for $11.99 a month.